New spectrography and chromatography technologies took two of the three prestigious Editors' Awards at this year's Pittcon in New Orleans. The Pittcon Editor's silver award went to Nlisis Chromatography for its Meltfit One device that reliably couples gas chromatography columns together for specialised applications (Fig.1). The Meltfit One establishes stable and solid connections between capillary columns with the help of the Meltfit Tube. It is a novel small glass tube, which is gently positioned around the columns as a 'second skin', leaving no room for dead volume or leaks. This is achieved by melting the glass and adding pressure at the same time. Modern separation systems frequently use coupled-column set-ups. This is the case in advanced applications as GCxGC, but also in more standard situations, such as a simple coupling of a pre-column or retention gap to the analytical column. Coupling capillary columns is considered a difficult task, frequently leading to mis-performing couplings and substantial down time. Customer research by Nlisis has pointed out that analysts are not satisfied with the existing solutions. Current glass connectors are relatively easy to install, but prone to leakage, especially at higher temperatures. They are cheap to purchase, but too often deliver unsatisfactory results. The metal connectors are difficult to install, inflexible in terms of possible column IDs and ODs, they have a high risk of degradation, a high thermal mass and are expensive. Based on the above weaknesses of the current solutions, the company developed Meltfit One as a solution that has a low cost of ownership, absolute leak tightness, no dead volume, no adsorption, no band broadening and no thermal degradation. In other words, a much higher sample throughput for the lab. The company was founded just two years ago and Pittcon was the first major trade show it had ever attended, a fact not lost on ceo Wil van Egmond. "We started out only two years ago, with the goal to develop and launch products that make GC-technology easier to use, and decrease the total cost of ownership through a faster and better performance. The Meltfit One is our first proof of that mission. This award stimulates us to intensify our development efforts and step forward with additional products that help solve other remaining nuisances of chromatography analysts around the world," he said. Meanwhile the Pittcon editors' bronze award went to Bruker for its S2 Picofox benchtop total-reflection X-ray fluorescence (TXRF) spectrometer for trace-element analysis (Fig.2). The TXRF technique was previously limited to large systems used for semiconductor and coatings testing. The transportable S2 Picofox, designed for lab or field use, opens up TXRF to complement or replace atomic absorption spectroscopy and inductively coupled plasma mass spectrometry in clinical, nutritional, mining, and environmental applications. The instrument offers 'zero-wait sample prep', allowing direct analysis of nanogram or larger amounts of almost any type of liquid, suspension, solid, filter, or particulate matter sample. It incorporates Bruker's XFlash silicon drift detector to measure elements ranging from aluminum to uranium at concentrations from 0.1ppb to per cent levels. Bruker also took the Pittcon Editors' gold award with its X2S compact X-ray crystallography system. Among other highlights at Pittcon was a range of new products and applications from PANalytical. The company's focus on extending the use of X-ray fluorescence (XRF) spectrometry and X-ray diffraction (XRD) in the pharmaceutical industry saw the announcement of MiniPal 4 Pharma and the US launch of CubiX Walk-Up. MiniPal 4 Pharma will find applications in materials verification, catalyst residue analysis and detection of contamination, from stainless steel vessels for example. CubiX Walk-Up is the first system to bring 'walk-up' functionality to X-ray powder diffraction users. With a simplified interface for anytime access, CubiX Walk-Up delivers fully automated measurement, analysis and reporting in a multi-disciplinary environment (Fig.3). As authorised distributor for OBLF in the US and Brazil, PANalytical also introduced that company's VeOS spark emission spectrometer at Pittcon. The system features cutting-edge detector technology that delivers analytical performance equal to established photomultiplier-based systems. The semiconductor detectors in the VeOS system were specifically developed for emission spectroscopy and, according to the company, are 100 times more light sensitive than others found in similar systems. VeOS enables versatile, flexible and rapid analysis of all common metallic materials, and offers the possibility to extend analytical capabilities to include more matrices without the need for hardware changes. The analytical range of the VeOS includes the precise analysis of short wavelength elements such as nitrogen or low carbon. Another highlight was the new NicoletiS10 FT-IR spectrometer from Thermo Fisher Scientific. Designed for IR spectroscopy for QA/QC and investigative analytical laboratories, the device is powered by new OMNIC Specta software. According to the company, this easy-to-use system simplifies spectroscopy, enabling chemists in analytical and investigative chemistry laboratories to take full advantage of the power of FT-IR and have complete confidence in their results. Analytical laboratories increasingly require more efficient instruments to carry out analysis of raw materials and finished goods. For such analyses, FT-IR is a technique of choice. The Thermo Scientific NicoletiS10 FT-IR spectrometer system significantly simplifies data analysis, sampling and instrument validation (Fig.4). "Spectral interpretation has remained the most significant hurdle in FT-IR," said Ian Jardine, vice president of global research and development for Thermo Fisher Scientific. "FT-IR rapidly gets the user from 'sample to spectrum'. However, getting from the spectrum to actionable information, such as identification, was often a highly subjective, iterative and laborious process requiring high levels of skill and time." Using what the company describes as revolutionary deconvolution protocols, Thermo Fisher Scientific's new OMNIC Specta software, integrated with the Nicolet iS10, dramatically simplifies the interpretation process. "The software allows users to identify individual components in a mixture from a single spectrum in one simple step. Materials can be identified rapidly, and with complete confidence, in a fraction of the time by anyone with basic chemical knowledge," added Jardine. To give users further assurance of the reliability of their results, the device also incorporates spectral performance verification (SPV). This function monitors the accuracy and performance of the spectrometer on a regular basis, giving users complete confidence in their results and avoiding the possibility of repeating tests. The instrument checks can be carried out overnight, ensuring that the system is fully prepared for the following day. Finally, leading Waters' new offerings at Pittcon 2008 were: the PATROL UPLC Process Analyser, a real-time liquid chromatography (LC) online process analytical technology (PAT) system; the SYNAPT MS system, an upgradeable next-generation quadrupole orthogonal acceleration (oa) time-of-flight (Tof) mass spectrometry (MS) platform; and SDMS VP's Intelligent Procedure Manager (IPM), a workflow software package to guide analysts through laboratory procedures. The new PATROL UPLC Process Analyser is a real-time online PAT system able to detect and quantify complex multiple component manufacturing samples and final product on the production floor. Designed with the same enabling technology platform as Waters ACQUITY Ultra-Performance Liquid Chromatography (UPLC) System, the PATROL UPLC Process Analyser moves existing liquid chromatography (LC) analysis from off-line QC laboratories directly to the manufacturing stream resulting in significant improvements in production efficiency with real-time analysis, reducing both process cycle times and assuring product quality. Waters is currently collaborating with several global pharmaceutical companies to quantify the PATROL UPLC Process Analyser's impact on the manufacturing process. For its part, the new SYNAPT MS system is a key part of the company's strategy to enhance the quality and productivity of life science and drug discovery and development workflows. 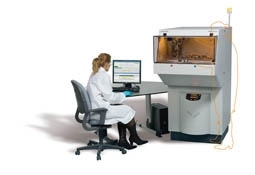 Additionally, says the company, the SYNAPT MS system is the only platform which provides a turn-key upgrade pathway to the SYNAPT High Definition MS (HDMS) system, enabling researchers to analyse samples differentiated by size, shape and charge, as well as mass, ultimately providing new capabilities that can help them meet and exceed their future requirements.